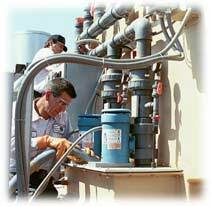 FUME CONTROL TECHNOLOGY, INC. (FCT) provides an extensive line of services for your Fume Scrubber's needs. We provide contract-cleaning services including monthly, annual and semi-annual preventive maintenance programs. Periodic maintenance keeps your Fume Scrubber(s) operating efficiently, as designed by the manufacturer. Fume Scrubbers are used extensively in the Semiconductor, Biotechnology, and Plating industries to eliminate the fumes and vapors that result from the variety of chemicals that are often used in these processes. There are a several conditions that will result in a loss of scrubbing efficiency. A fouled media bed or mist eliminator, water distribution headers and nozzles, or other harmful conditions may jeopardize operational efficiency and could result in a liability risk for your facility. Fume Scrubbers prevent gaseous pollutants, contaminated air, and toxic vapors that develop in various manufacturing and processing facilities, and other internal work sites, from polluting the atmosphere. Consequently, it is important to sustain a periodic inspection and maintenance program to keep your unit running first-rate. 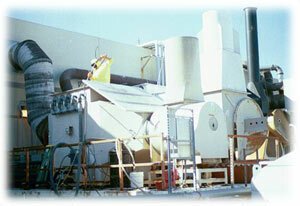 Fume Control Technology, Inc. cleans and replaces a wide range of random and structure pack media. Different types of media are available in a wide variety of materials and designs. FCT can assist you in choosing the correct type for your application. Our technicians can service many different types of units by cleaning the media in place or removing it from the unit to gain access to hard to reach places. Feel free to call our staff at any time for an inspection of your equipment. FCT assures NO UNEXPECTED DOWNTIME during our services. vacuum hose extracting the media. "Fume Scrubber Media Change Out"
into a dumpster for disposal.